We were surprised to learn this is called the rule of three, as we had only heard of the rule of three in comedy. We were even more surprised when a reader wrote in telling us about a rule of three in statistics. According to Wikipedia: the rule of three states that if a certain event did not occur in a sample with n subjects … the interval from 0 to 3/n is a 95% confidence interval for the rate of occurrences in the population. It’s a heuristic. We love heuristics! We test everything that comes off the line, one by one, until we come across a defect (test number n+1). We then make a confidence interval bounded by 0 and 3/n and make note of it. In the long run, about 95% of such intervals should contain the true underlying probability of defect. Because it’s a simulation and we know the true underlying probability of defect, we make note of whether the interval contains the true probability of defect. We repeat this 10,000 times at each of the following underlying probabilities: .001, .002, and .003. Let’s work through and example. Suppose you watch 1,000 products come off the line without defects and you see that the 1,001st product is defective. You plug n=1000 into 3/n and get .003, making your 95% confidence interval for the probability of a defective product to be 0 to .003. The simulation thus far assumes the testers have the patience to keep testing until they find a defect. In reality, they might get bored and stop testing before the first defect is found. To address this, we also simulated another condition in which the testing is stopped at n/2, halfway before the first defect is found. Of course, people have no way of knowing when if they are half the way to the first defective test, but our simulation can at least let us know what kind of confidence interval one will get if one does indeed stop halfway. 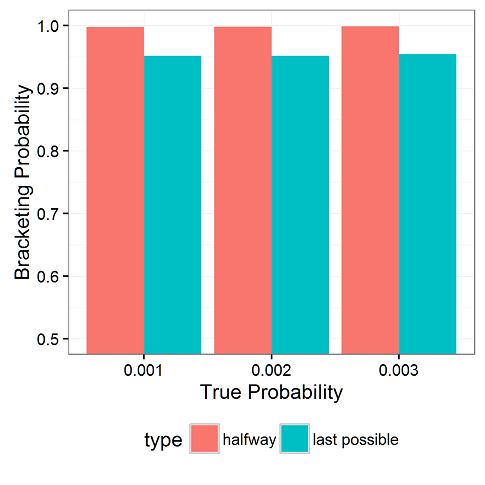 Across all three levels of true underlying probabilities, when stopping immediately before the first defect, we get 95% confidence intervals. However, when we stop half way to the first defect, we get closer to 100% intervals (99.73%, 99.80%, and 99.86%, respectively). So we know that the upper bounds of these confidence intervals fall above the true probability 95% to about 99.9% of the time, but where do they fall? 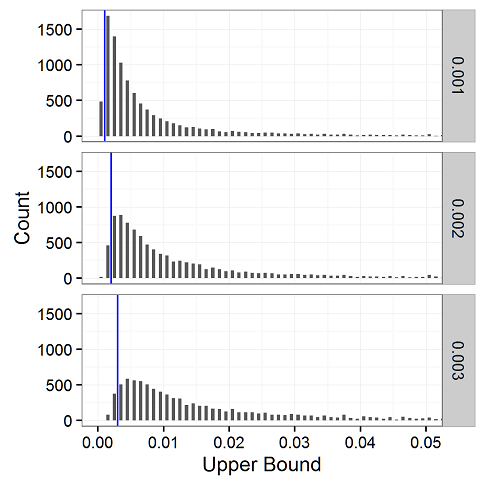 In the uppermost figure of this post, we see the locations of the upper bounds of the simulated confidence intervals when we stop immediately before the first defect. 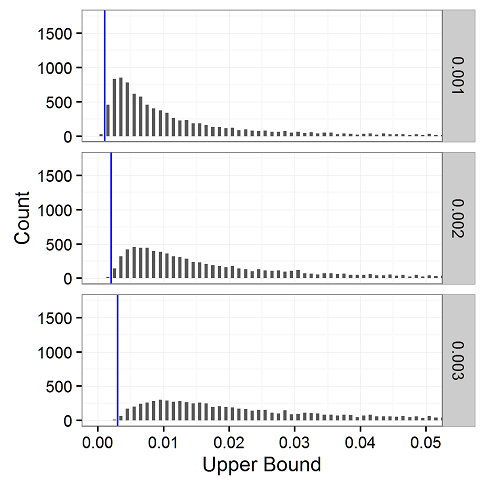 For convenience, we draw blue lines at the true underlying probabilities of .001 (top), .002 (middle), and .003 (bottom). When it’s a 95% confidence interval, about 95% of the upper bounds should fall to the right of the blue line, and 5% to the left. Note that we’re zooming into to cut the X axis at .05 so you can actually see something. Keep in mind it extends all the way to 1.0, with the heights of the bars trailing off. Another rule of three, this one in statistics was written on April 14, 2017 and filed in Encyclopedia,Ideas,R.